When you are looking for new homes in DFW, you don’t need to look much further than our master-planned community! With a great location just north of Frisco and east of Denton, you’ll have plenty of options for date night, family night or a night out on the town! Another great city just to the southeast of ArrowBrooke is Allen, TX! Known for its variety of shopping and unrivaled HS football team, see what events are coming to this great town that are perfect for ArrowBrooke residents. Out of all of the Christmas traditions, there’s nothing quite like hanging ornaments on the Christmas tree with your kiddos. Instead of buying ornaments, go to Salado Glassworks and make your own! Not just any ornament, your very own glass-blown ornament that you will actually blow yourself. This unique opportunity only requires your kid to be 3-years and up. Allen, TX loves to put on events that bring the whole community together, and the Marvelous Heroes Movie Series is the perfect example of that. Bring out the entire family for a night of fun and movie watching! Round up the whole gang – the cost is free! This is an event that will be fun for the whole family! Join the hosts Mickey Mouse and Minnie Mouse as they share the stories of four heroic Disney Princesses on the ice. Buy tickets today to Disney On Ice in Allen, TX! ArrowBrooke is located near so many great cities that give you endless options for entertainment. Living in our master-planned community means you’ll never have to go far to find fun! 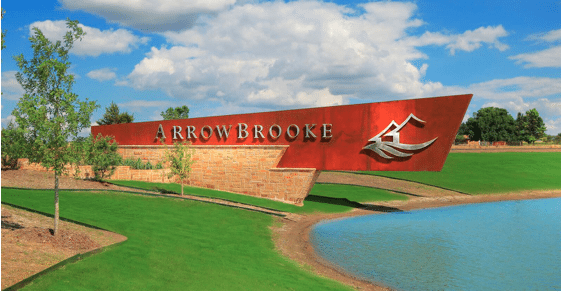 Learn more about living in ArrowBrooke and find your new home in DFW today!